Even as America and its European allies begin their war campaign against ISIS and its self-proclaimed Islamic State in Syria and Iraq, European Muslims are increasingly showing their support for Islamic terror groups and their jihad. With the number of Muslims heading to Syria to join ISIS and Al Nusra (the Syrian branch of Al Qaida) on the rise, those who remain behind in countries like Belgium and the Netherlands are now working to raise funds to support their families, and to defend other European Muslims accused of plotting terrorist attacks at home. In fact, according to the Wall Street Journal, "Europe is increasingly becoming a recruiting ground for jihadists heading [to Syria and Iraq] to join terrorist groups like Islamic State." So far, the number of Europeans who have already joined the jihad in Syria is estimated to be between 2,500-3,000, with the largest number per capita coming from Belgium and from France. 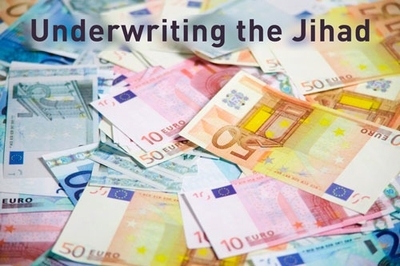 But others, according to a recent article in Dutch national daily Trouw, are working for the jihad in different ways, largely through fundraising efforts. In the Netherlands, for instance, many in the Muslim community are now raising collections to assist the spouses and children of jihadists with cash, food, and other necessities. According to the jihadists, reports Perdiep Ramesar, who penned the article in Trouw, "the families need assistance because their welfare payments have been stopped, their assets frozen, and legal costs are too high." It was invoked in the United States 23 years ago during the Palestinian Intifada. Fawaz Damra, a Cleveland imam since deported, was raising money for the Palestinian Islamic Jihad, routing the money through a charity called the Islamic Committee for Palestine. Giving money, he told his audience, was as good as taking to the battlefield. God says, the Messenger, God's blessing and peace be upon him, says, 'Whoever equipped a raider for the sake of God, has himself raided.' Whoever donates for a mujahid so that he may throw stones, is as if he too is fighting the Holy War, and will be rewarded like him, even if he stays home. 'Whoever equipped a raider for the sake of God, has himself raided' ... This is the Islamic Jihad Movement. I say to you to donate, so that this money will serve you with God. In the Netherlands and Belgium, contributions, which are gathered through social media efforts, are directed exclusively at terrorism suspects, Ramesar writes, pointing to Dutch and Belgian Twitter and Facebook fundraising campaigns such as "Free Aseer" and "Project A." Dutch authorities earlier this year agreed to stop all welfare payments to those who had already gone to Syria, as well as to some arrested on charges of planning to make the trip. Muslim radicals convicted of terrorist activity have also had their accounts frozen or seized. Often, the wives of these jihadists are unable to support themselves and their children, either because they have toddlers at home to care for or – more often – because their own extremist views restrict them from working. Among those receiving aid are the family of Mohammed Bouyeri, the convicted killer of Dutch filmmaker Theo van Gogh; Samir Azzuz, a co-member with Bouyeri of the Dutch extremist Hofstadgroep, who served eight years on suspicion of plotting terrorist attacks in the Netherlands – and whose assets remain frozen even after his release; Umm Haneefa, a Belgian woman accused of "taking part in the activities of a terrorist organization"; and Sharia4Belgium leader Fouad Belkacem, currently being tried in Antwerp courts along with 44 other Sharia4Belgium members on terrorism charges. How much has been collected to date is unclear, Ramesar writes, though "sources close to" the various families confirmed receiving financial assistance through these campaigns. But in the end, that number isn't what really matters. More significant is what the success of such fundraising efforts reveals: a European Muslim community that increasingly supports radical Islamic, pro-sharia movements, and willingly underwrites their jihad. It is a kind of silent jihadist movement, a form of terror funding that slips beneath the radar, and between the laws. More, it demonstrates the urgency of what we are facing now in the West. Yes, we were far too late in recognizing the threat of ISIS in Syria and in Iraq. But Europe – and America – can no longer afford to underestimate the insidious and growing threat it poses to us here at home. As of probably 8 years ago the Saudi's set financial controls in place that recorded any transaction of $10K or more being transferred overseas. They also started recording the Friday sermons and fired (took them off the Saudi Gov. payroll) over a 1000 Imams that refused to change their tone and edicts and handed their Mosques to someone a little more moderate. Maybe just maybe there is a lesson to be learn't by Europe, the UK and the USA. I think Australia has already heard the msg. Not permitting the building of centers of terror and 5th column centers (commonly known as Mosques) might be a good starting point. Saudi might also think of setting an example by publicly allowing alternative faiths to co-exist within Saudi.